Another important milestone for us was to ride the rails, which we did when we caught a train to Stirling on the 28th. How perfect was that? Traveling by train allowed us a terrific view of the beautiful countryside as we rolled across the Highlands to the historic city. The rain was a bit heavier that day, but we soldiered on, hiking across this foreign place. Seeing the Wallace Monument far off in the distance, we walked toward it, pausing at the infamous Stirling Bridge, site of William Wallace’s greatest military victory and dining at the Wallace Pub for a spell. We were spent. We’d walked hundreds of miles so far on this trip. To be honest, I was amazed at how well we held up. But we were starting to feel it. 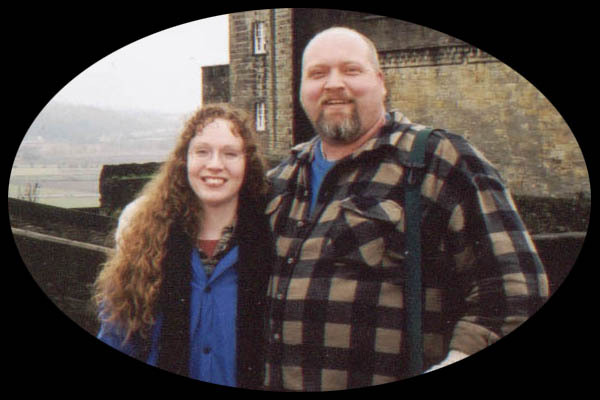 Still, we soldiered on and walked into Stirling proper, ate again, this time at Hog’sHead (where we had the best salmon I’d ever tasted), then marched on Stirling Castle, ancestral home of the Clan Stewart. Stirling Castle was magnificent. Under heavy renovation, the Castle was a stark contrast to the one in Edinburgh. This Castle had the feel of being lived and fought in and it was really one of the high points of our trip. Stewart blood runs through my family’s veins and it was a thrill to walk the very battlements where my ancestors once did. 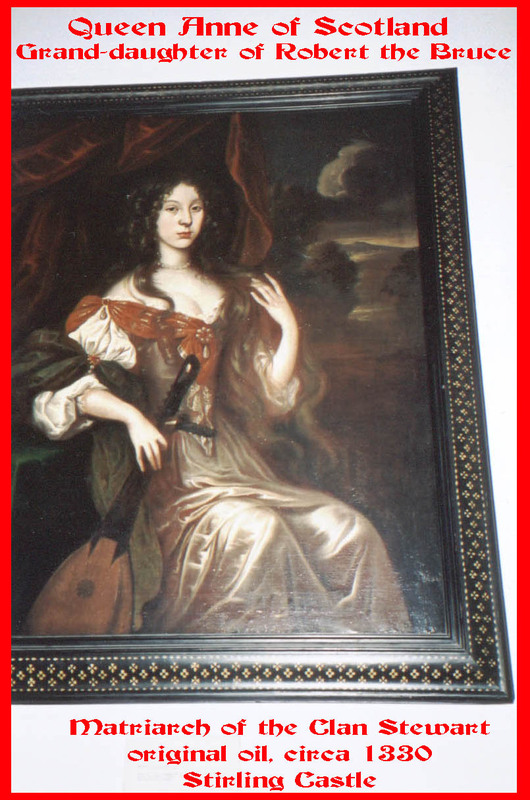 One surprise was coming upon a painting of Queen Anne, granddaughter of Robert the Bruce. Looking at that picture I couldn’t help but notice a more than passing resemblance to my own beautiful wife. I felt connected to my forefathers in a way unimaginable and it occurred to me that my connection to my wife was strengthened by this mystical bond that reached out across time, through our common ancestry, as if we were fated to be together. Heading back by train, our hearts were heavy. This was the end of our trip. The next day we’d be flying back to the States. Back to the real world. One thing we knew for sure though — Scotland would be in our hearts forever. This entry was posted on March 28, 2016 at 9:14 am and is filed under Alba Gu Brath. You can follow any responses to this entry through the RSS 2.0 feed. You can leave a response, or trackback from your own site.